TransLink has put together a series of backgrounders as part of the process of updating its long-term Regional Transportation Plan (RTP). Since I’ve been talking about parking lately and how it impacts urban forum, I was happy to see that TransLink has included a research paper on parking in the region as part of the RTP update process. As you may know, I’ve been talking about the abundance of surface parking in the City of Langley lately and how I believe the City can dial-down the minimum parking requirements in some areas. 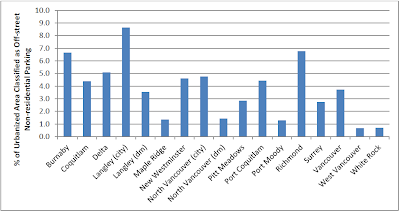 The following table shows that the City of Langley is the leader in surface parking lots with 8.6% of its urbanized land dedicated to non-residential parking. 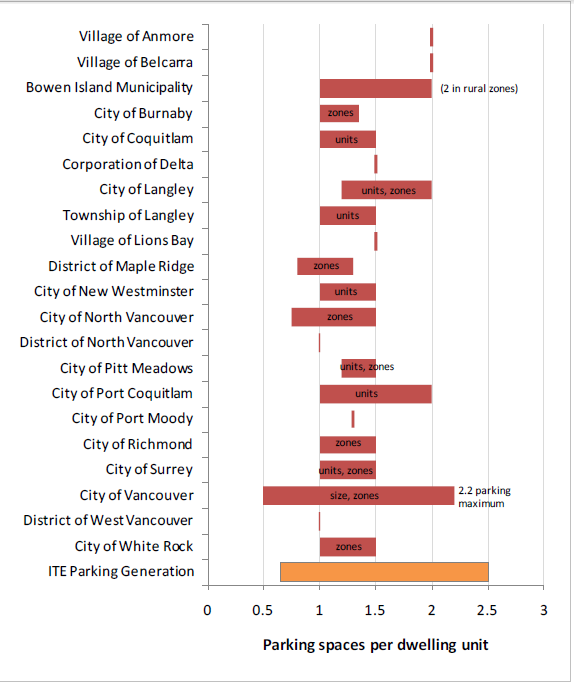 This is really interesting considering that other similar-sized community like White Rock, New Westminster, and Port Moody dedicate way less land as a percentage of their overall urbanized areas to parking. Urbanized land does not included the Agricultural Land Reserve. Percentage of the total municipal urbanized area that is off-street non-residential parking. The urbanized area is calculated from the urban containment boundary as adopted in the Regional Growth Strategy. Source: TransLink Parking Stall Tax Database, Metro Vancouver Regional Growth Strategy. Click graph to enlarge. 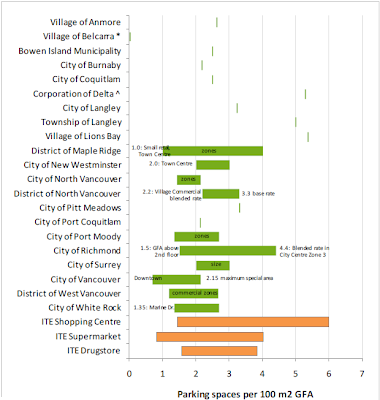 I should point out that when it comes to absolute numbers, Langley City has a small number of non-residential parking spaces (20,000 spaces compared to about 130,000 in Vancouver and 190,000 in Surrey), but these communities have more parking underground and/or in structures; and are just bigger. 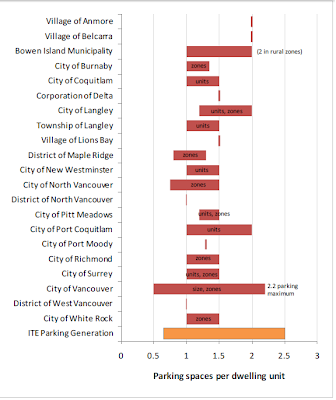 Another interesting graph shows the minimum (and in New Westminster/Vancouver maximum) off-street parking requirements for retail land use. Parking requirements for general retail land uses. Click graph to enlarge. Looking at this table, both Langleys are leaders when it comes to the provisioning of parking. 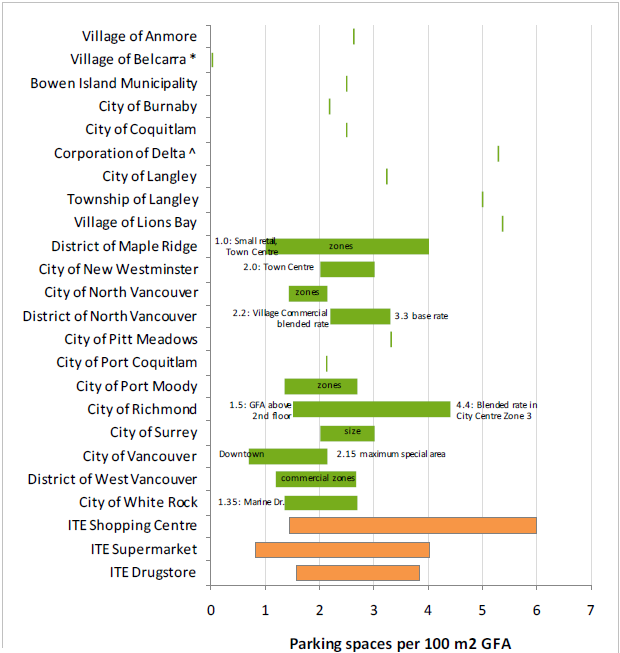 The Township of Langley requires 150 square meters of parking for every 100 square meters of retail floor space according to the graph. This means that the Township of Langley dedicates more space to cars than people! While some people might think that parking requirements are higher in Langley because of poor transit service, I should point out that Maple Ridge (which also has poor transit service) has more flexible parking requirements. While parking for commercial-uses varies widely in the region, residential parking seems to be more uniform. Parking requirements for multi-unit residential land uses. Vancouver parking requirements vary based on size of dwelling unit. Click graph to enlarge. While I think residential parking requirements are not an issue in the region, I believe that some communities have over-provisioned off-street, non-residential parking and need to reevaluate their off-street parking policies.